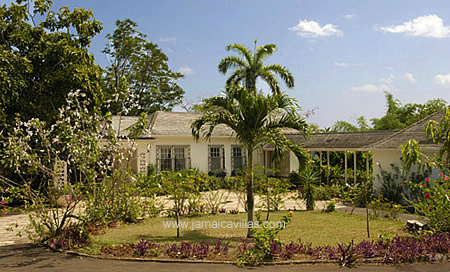 Pimento Hill is a spacious private home with a legendary history. The villa overlooks the Caribbean Sea and is located just five minutes from chic Round Hill where guests enjoy complimentary membership. Pimento Hill was extensively renovated and refurbished to a high standard while retaining many period features. Today, owned by a family in London, Pimento Hill's essence is the tasteful marriage of Colonial grandeur of a bygone era complemented by modern amenities and comforts one would expect in a luxury villa. Priceless chandeliers and antiques define character. Marvelous meals emerge from the modern kitchen. Comfortable bedrooms feature top-of-the-line mattresses and en-suite bathrooms. Delicate orchids adorn the rooms. The grounds include water gardens, hidden walkways, an arched bridge and sprawling grassy lawns. Pimento Hill’s six acres are a virtual orchard of mango, orange, grapefruit, breadfruit, lime, tangerine, avocado and even a cotton tree! Large lawns encourage children to run around and even learn a bit of cricket from senior gardener Ralston. One enters the Main Villa through a classic Italianate pink and cream marble entrance hall. This building houses the 1,000-square-foot Great Room on original mahogany floors and the extraordinarily large modern kitchen with six-burner gas stove and wide granite countertops. The inside formal dining area features a gleaming mahogany table and 10 Queen Anne chairs under a stunning crystal chandelier. The Great Room opens onto the long verandah with bar, comfy couches for cocktails and hors d’oeuvres, and al fresco dining area for up to 20 guests. Completing the Main Villa is the 800-square-foot Blue Bedroom with antique French crystal chandelier. Optional kingsize or twin beds plus a daybed for a child. En-suite bathroom with bathtub and separate shower. French doors open to a small garden porch where eye-opener coffee or tea is placed early each morning. Just across a porte-cochere is the second building which houses the impressive Master Suite with renovated his & hers bathrooms, jacuzzi bathtub in ladies room, kingsize four-poster bed and two adjoining 175-square-foot rooms. The children's room can be either twin beds for youngsters or kingsize for adults. The second room has a 13‘ antique dressing table and daybed for another child. Both the children’s room and the dressing room open to their own individual en-suite bathroom with mosaic-tiled circular sunken bathtubs with showers. The door to the Jacuzzi bathroom can be closed and locked for privacy from the Master Bedroom. The 1,500-square-foot Master Bedroom opens through 12 louvered doors to garden and sea views, and to a private porch where eye-opener coffee or tea is quietly presented early each morning. French doors on the south wall of the Master Villa open to a 35’ covered brick walkway to the Study. Just across the covered walkway from the Master Bedroom is the cozy Study. Its 100-square-foot bedroom has optional king or twin beds, small shower room, and separate small toilet room. The adjoining study has a 42” flat screen TV, desk for laptop users (wireless Internet access), bunk beds and twin-size daybed for an additional guest. An 80' path through the shaded water garden leads to two more private bedrooms located on the pool deck. One bedroom has a kingsize bed; the other has optional king or twin beds. Each has an en-suite bathroom and shower. One also has an adjoining outdoor shower, accessible via both a door from the twin bathroom and also via a gate from the pool terrace. While the large, deep swimming pool gets all-day sun, the adjacent terrace has a covered sitting area and unique copper bar for poolside drinks. On request, lunch will be served by the pool in sun or shade. Maximum desired occupancy is 14 guests. Pimento Hill is a remarkable venue for weddings and entertaining. Additional charges apply for events with guests in excess of 14 live-in guests. In early 1966 the Queen and Prince Philip made a 5 week tour of the West Indies which culminated in their visit to Jamaica. They spent 3 days in Jamaica, arriving in Montego Bay on the Royal Yacht, Britannia. The lights of the Royal yacht twinkling in the Montego Bay harbour became a brief sight-seeing attraction. There was huge excitement as the Queen made history visiting small villages and towns in the Parishes of Hanover and Westmoreland, which had never before received a royal visit. After their last official engagement which was a civic reception in Charles Square, Montego Bay, on the morning of March 6th, the Queen and Prince Philip had some time to themselves. They went to stay at Pimento Hill House with the Count and Countess De Sibour who owned Pimento Hill at that time. This was an incredibly precious time for the Queen and her Prince as it gave them some time to relax and rest in complete privacy before the Queen flew back to London ahead of Prince Phillip. The Prince remained at Pimento Hill until Tuesday 8th March when he flew on to the US and Canada. They must have treasured this time together at Pimento Hill as they knew that they would be apart for the following 2 weeks. In the Jamaica Gleaner on March 6th 1966, it is reported that: "the acting prime minister, the Honourable Donald Sangster, has asked the public to cooperate and so allow Her Majesty and Prince Philip to spend a quiet afternoon and evening today and, similarly, after Her Majesty's departure, to permit His Royal Highness a few days of rest." In the Queen's Diamond Jubilee year of 2012, today's owners of Pimento Hill wrote to the Queen to ask whether she recalled her stay. Her Lady-in-Waiting replied with the Queen's response: "Although so many years have passed, the Queen recalls your beautiful villa very well and has happy memories of the time she spent there." Her letter is on display at Pimento Hill. Occupancy of more than 14 guests will be charged at $100 per night. It has been a wonderful experience! Thank you to the staff who made everything possible. Staff went to great lengths to ensure our comfort and enjoyment. The house was quirky with tons of character. Exceeded our expectations! The staff was professional & warm. We were so well taken care of. We cannot wait to return, it was everything we hoped it would be! Staff – the best. Villa – the best. We DO love this villa! This is a wonderful home with the most remarkable people. Huge compliments to the chef! All of the staff was so warm – they felt like family. We were sad to leave, but made new friends and amazing memories.